Juicy sweet watermelon is a summer favorite, and at Baywater Farms we grow the best watermelon on the Eastern Shore. Our watermelons soak up the sun during a long growing season and soak up the attention of our careful farmers for a deliciously healthy final product. Baywater Greens watermelon is available in the summer just in time for picnics and barbecues. We carefully monitor growing conditions for our watermelons so that our vines bear delicious, healthy fruit in the variable summer climate. We have perfected our growing method to produce sweet fruit that is never bitter or mushy. 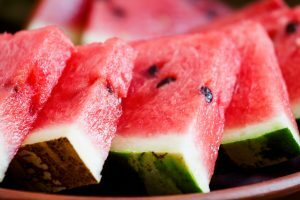 Watermelons are traditionally enjoyed raw, with only a cutting board and knife needed for a delicious summer dessert. Watermelon loses its distinct flavor when heated, but it works well in a variety of chilled applications like fruit smoothies, fruit salads, and served with savory cheeses and bright fresh herbs in chilled salads. Watermelons need plenty of time to sweeten in the summer sun, so we wait to pick ours until they are perfectly delicious. A ripe watermelon should sound hollow when you tap on it and have a minor amount of contrast between the stripes. We pick watermelon when it is ripe, and the rind has changed to a full green and the portion of the watermelon touching the soil turns to a creamy yellow. Watermelons can be stored uncut, after picking for up to 10 days. Store your picked watermelons in a cool area without sunlight to maximize their longevity. Once you cut your watermelon, it can last in the refrigerator for up to four days when wrapped in plastic or sealed in a tight container. Chunks of watermelon can be frozen to turn into smoothies or slushies, but frozen watermelon will lose its structural integrity if thawed. Baywater Farms is passionate about cultivating watermelons with love and care in the same soil that our great-grandparents tilled. On our sixth-generation family farm, all of our heirloom produce is grown using high-quality seeds that yield gorgeous, colorful, and delicious results. We use ecologically-friendly farming methods and are dedicated to preserving the provenance of our seeds, re-introducing historical crops, and supplying everyone in the area with locally grown produce with a conscience. You can find our fresh watermelons in national grocery store chains, produce distribution companies, roadside farm stands, local farm-to-table restaurants, CSAs, and farmers’ markets. To learn more about ordering our fresh local produce, click here. Our excellent produce speaks for itself, and we know your taste buds will love to listen!